Have you ever needed or wished you had a big hug for comfort from Jesus' unconditionally loving arms? The Christ Community Church Prayer Shawl Ministry tries to make this happen. Beanies are the hats for ladies on chemo and caps for babies born with a low birth weight. Blankets are the lap blankets and shawls. Wheelchair bound kids or adults can have a shawl made with colors of their favorite sports team. Autistic patients can have a matching shawl and prayer cloth for a child and mother, with the theme "Puzzle Pieces" in their favorite colors. Blessings are all the prayers from our church community that the shawls and hats hold. Who Can Request a Shawl or Hat? Why Give a Prayer Shawl or Hat? Bereavement to console, comfort and hope to the sick, elderly in a nursing home, babies with special needs, those broken in spirit with depression, anxiety or any mental anguish. The different colors in the shawls and hats have different meanings. Is This Related to the Bible? The stitches have biblical roots. They chain 80 stitches to represent the 40 days and nights of Lent, Noah's time on the Ark and MOST important Jesus being tempted in the desert. They crochet 3 double stitches to to make a shell to represent the Trinity; 5 double stitches represent the 5 wounds of Christ on the Cross; 39 rows on a baby blanket stand for the 39 strikes Christ endured before his crucifixion. These shawls and hats are vessels that hold prayers of the crocheters, our pastors and all the church. The shawls and hats are not magic, but miraculous things have happened in HIS name. Who Knits the Shawls and Hats? 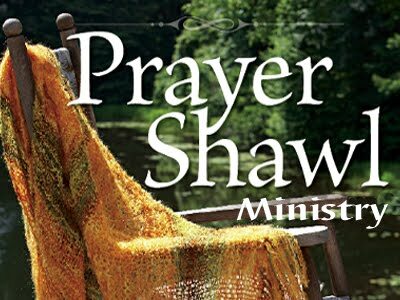 The Prayer Shawl committee consists of Thelma Hagerman, Lee Ann Mullen and Diane Christian. These wonderful ladies put a lot of love and prayer into the shawls and hats. How can I Request a Shawl or Hat? If you would like to give a shawl or hat, please contact Thelma Hagerman at 270-929-2421 or the church office at 270-686-6327.